Getty/Justin SullivanCostco probably still wants customers to come to its stores. Costco now has more options than ever to shop online with quick delivery. But these services come at an extra cost – some items can cost up to 20% more than they would in the store. It’s clear Costco‘s new online services are not meant to replace going to its stores. It’s now easier than ever to shop online at Costco. 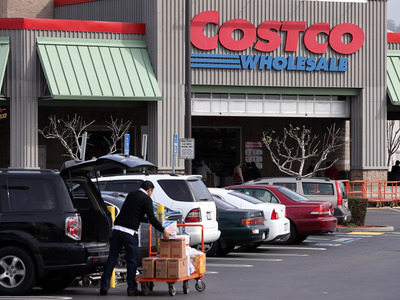 Last year, Costco drastically bolstered its online services, expanding its Instacart same-day-delivery partnership and launching two-day Costco Grocery shipping in an effort to compete with Amazon, which is testing two-hour delivery from Whole Foods stores in some US cities. But there are some caveats associated with using Costco’s services. Ordering from Instacart comes with all its usual fees – $US10 an order, or free delivery on orders over $US35 for $US145 a year. But if customers use Costco’s same-day-shipping site, ordering from Instacart is free. Costco Grocery shipping is free for purchases over $US75, but each item comes with an extra shipping charge before that threshold. Instacart is available in many metro areas, whereas Costco Grocery can deliver nationwide but is focused on nonperishables. But many customers have noticed that the prices of Costco’s offerings can vary from in-store to online, and even from online service to online service. Instacart says as much on the “pricing policy” section of its website. “Prices are higher than your local warehouse,” it reads, warning shoppers not to expect the same deals Costco is known for. In comparing Costco’s prices online and in stores, the San Francisco Chronicle found that those online were consistently higher across nearly every category. For example, a two-pack of Kirkland Signature organic creamy peanut butter was $US9.99 in a store but $US11.99 online, an increase of 20%. Others, like frugal-living bloggers, have also found similar price discrepancies. Costco’s online sales grew by 28.5% in its most recent quarter, the company said earlier this month. “There’s a lot of low-hanging fruit there, because there’s a lot of things we haven’t done in the past,” Costco’s CFO, Richard Galanti, said in an earnings call. Costco’s e-commerce efforts are going after the customer who doesn’t have time to do “the big shop” in one of Costco’s warehouses but is still looking for gallons of peanut butter. They’re less likely to be concerned about price and won’t balk at paying a few extra dollars per item. But the higher prices still give many customers a good reason to head to the store, where the floor layout can help entice them to pack more into a single trip.